• You may not touch any sand in the bunker on your backswing before making your stroke (Decision 13-4/31). This can sometimes be very difficult when your ball lies at the back of a steeply-sloped bunker. It might even mean playing out sideways or backwards to avoid the penalty of two strokes or loss of hole. • You may not touch any loose impediments in the bunker with you club other than when you make your stroke, which commences with the forward motion of the club made with the intention of striking the ball. Loose impediments are anything natural, including divots, loose moss, leaves, twigs, stones, etc. (Rule 13-4c). Of course, you may touch stones if there is a Local Rule permitting the removal of stones from bunkers. You may also move loose impediments in order to find or identify a ball that is believed to be lost in a bunker, but they must be replaced if the ball is found or identified in that bunker (Rule 12-1b). • But, you may touch any grass, bush, tree or other growing thing with your club at any time, including on the backswing preceding your stroke (Note to Rule 13-4). So, if your ball lies at the back of a bunker and you cannot make your stroke without brushing growing grasses that overhang the lip of the bunker with your club, there is no penalty for doing so, either with a practice swing or your actual stroke. you may lay a club, or clubs, in a bunker whilst you are playing out of it (Exception 1,(b) to Rule 13-4). • You may smooth sand in the bunker, providing this is for the sole purpose of caring for the course and you do not improve the position or lie of your ball, the area of your intended stance or swing, or your line of play with respect to your next stroke (Exception 2 to Rule 13-4). • You do incur a penalty if you casually lean on your club in the hazard while waiting for another player to play (Decision 13-4/2). • There is no penalty if you accidentally touch your ball with your club, providing it does not move (Decision 13-4/12). Do you know the many differences between the Rules for stroke play and match play? My match play quiz could help you win your next match. Click here for more information. I have a three points to make here. First, the relief that you are referring to is only available when there is interference by casual water. Second, there is a penalty of ons stroke, whereas if the player takes relief by dropping in the bunker there is no penalty. Third, most professional players prefer to play from the bunker than from the rough around the bunker. Under penalty of one stroke, outside the bunker keeping the point where the ball lay directly between the hole and the spot on which the ball is dropped, with no limit to how far behind the bunker the ball may be dropped. Related question came up at my club: what if player accidentally drops his club in the bunker? Most rules discussions have majority view of no penalty, because you are allowed to place clubs in bunker. But my feeling is that if it's a penalty to accidentally touch the sand, then dropping the club should also be a penalty. There is no specific exception in the rules and no specific decision on this. What do you think? Whilst there is no specific Decision on dropping a club in a bunker, I am confident that this act would fall within Exception 1 to Rule 13-4, as obviously there is no intention to test the condition of the hazard. But if I was holding my club and absentmindedly let it touch the sand, without any intention to test the surface: why is that accident penalized but not the one of dropping the club (even more carelessly). I don't have any inside information as to the reasoning behind the Rules; my aim is to interpret them for others. I recommend that you check out Decision 13-4/0.5, which gives examples of what constitutes testing the condition of a hazard and what does not. If I was guessing, I would say that a club dropped in a hazard is akin to laying a club in a hazard, which is expressly permitted, whereas touching the sand with a club that you are holding is akin to grounding a club, which is expressly disallowed. I'm sure you're right and that seems to be the majority view on other Rules sites. I'll just try to remember, if I ever feel my club slipping from my grasp in a bunker, that it's best just to let it go, rather than try to catch it or hang on to it! suppose the club touches or rubs the ground first and then ball will it be called for penalty?? There is no penalty for touching the sand before the ball on a stroke (i.e. the forward movement of the swing made with the intent of striking the ball). 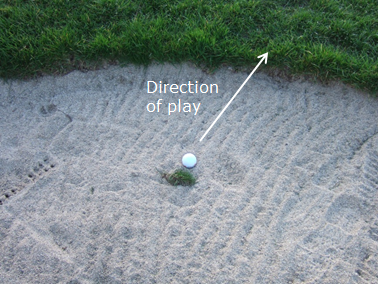 In fact, this is is how must bunker shots should be played, taking the sand before the ball. Hi, Please clarify on this. If a players ball is in the bunker and before he takes his shot or stance he uses his club to remove the rake and touches the sand with the club. what is the situation penalty wise? No penalty, as in this sentence in the above blog! "you may touch the sand in a bunker when removing an obstruction (e.g. a rake)"
Hello and congratulations for your blog. I understand there is no penalty if you acccidentally drop your club in the bunker while your ball is in the bunker, am I right? Correct. A player may even place a bag of clubs in a bunker in which their ball lies without incurring a penalty, Exception 1(b) to Rule 13-4. My tee shot on a par 3 lands in casual water in a green side bunker ; I mark the ball with a tee peg, lift the ball and drop the ball in the bunker at the nearest point of relief not closer to the hole ; i have not as yet played my shot - I proceed to pick up the tee peg and accidentally ground my club in the process of retrieving the tee peg - do I incurr a penalty and if so , what is the penalty? "1. Provided nothing is done that constitutes testing the condition of the hazard or improves the lie of the ball, there is no penalty if the player (a) touches the ground or loose impediments in any hazard or water in a water hazard as a result of or to prevent falling, in removing an obstruction, in measuring or in marking the position of, retrieving, lifting, placing or replacing a ball under any Rule or (b) places his clubs in a hazard." In a competition, i found myself in the bunker and proceeded to hit my ball out. I hit it and it caught the lip and rolled back in. I then went to regrip my club and i accidentally touched the surface while regripping it. I was told i had incurred the penalty of two strokes. Is this right? Yes, you breached Rule 13-4b by touching the ground in the bunker with your club. I touched the sand due to dropping the club while I waas regripping it in the bunker? Am I still penalised for accidently dropping the head of the club onto the sand while regripping? Barry, thank you for your comment. I have found in other defintion of the rules the following. "If you drop your club in the bunker, there is no penalty. I have seen rule this in a few places? Is this a grey area. You said yes, a penalty exists for this, otherss say no penalty is taken? What is then the efintion of dropping the club if this is correct? Exception 1 to Rule 13-4 permits a player to purposely place (or drop) a club in the bunker. This means to completely let go of the club so that it is resting in the bunker! My understanding of the circumstance that you described was that the player was holding their club when the club-head touched the sand and so the penalty was incurred. He said the dropping was not intentional and was not trying to test the sand as it accidently slipped out of his hand? So I suppose it is a penalty? Although I do seem to think this is not quite clear . Or am I just reading too much into this ruling? Great blog by the way? Take it from me that his action did incur a penalty. It is also a penaly if you accidentally move your ball, or accidentally touch the sand on a backswing in a bunker, or if you accidentally improve your line of putt by treading on a spike mark, etc. etc. Hi Barry, my ball was at the back of the bunker. On a practice swing (testing distance behind me from dirt bank), my club impacted with the dirt bank (at a height of approx 600cms) just below the grass verge. I declared this as grounding my club in the bunker and added two penalty shots to my score. Was this correct? Yes, you were correct to penalise yourself two strokes for grounding your club in the hazard. A wall of a bunker not covered with grass is part of the bunker, unless it is a stacked turf face. If playing a ball situated on the rough outside of the bunker but you have to stand in the bunker to play the shot (say with a steep side that is grassed) are you aloud to ground the club or do bunker rules apply? A player may always ground their club in a bunker, or water hazard, if their ball lies outside that hazard. A deep water hazard (dam, red posts) on our course was dry, I took two clubs with me down the bank and threw the club I wasn't going to use on the dry grass bank 10 yards behind me but still within the hazard. Was I guilty of grounding my cub? It was a stableford comp and my playing partner insisted I'd incurred a two shot penalty. At no time was the discarded club grounded while in my hand. You were right, they were wrong! Part of Exception 1 to Rule 13-4 expressly permits a player to lay a club or clubs in a hazard, provided nothing is done that constitutes testing the condition of the hazard or improves the lie of the ball. During our last foursomes match our opponents had to play out of a bunker. After an unsuccessful attempt by player A, their ball was still in the bunker. After his failed attampt to exit the bunker, player A hit the sand of the bunker again with his club deliberately (out of frustration, not a swing at the ball). Then player B played his shot out of the bunker and we carried on playing the hole. Needless to say: we won the hole (and the match). Just out of curiousity: could we have claimed the hole (for testing the sand?). If so, when could/should we have claimed the hole. Yes, the player breached Rule 13-4b when he touched the ground in the hazard with his club (not testing the surface) and you could have claimed the hole at that point.